Prepare to go Six Feet Under. 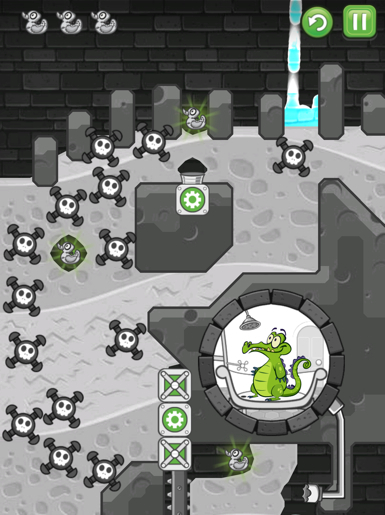 Yesterday, Disney released an update for Where's My Water? Free called the 10 Days of Frankenducky, a cool movie tie-in with Tim Burton's Frankenweenie. Players received five new stages right away, with one more unlocked each day. Being that it's October 2, we took a quick look at the day's brainteaser, Six Feet Under. Here's the best way to beat it. This is one of those puzzles with infinite water, so you don't need to worry about running out. Notice how it falls from the top right corner of the screen and begins to pool between those two pieces of stone. Continue to let that happen until it spills over and fills the first rubber duck, then immediately dig downwards so the H2O falls into that funnel, which causes the vertical platform at the bottom to move downwards. Now immediately dig to the right and then go left, creating an arc towards the second rubber duck. From there, dig down and towards the right so the water reaches the third and final ducky. Then it's just a matter of guiding it into the pipe leading to Swampy's bathtub. Simple, right? Of course, it's always better to see how it's done. For that, we have this video. Need solutions to the other puzzles?